Where It Started: My initial decision to make a change came 4 years ago when after a particularly stressful time I had put on 40 pounds. I had always been able to lose weight fairly easily even after 4 children, but as I was getting older it was getting harder. How did I let myself get so far off track? I needed to do something and quick! Gone were the days when cutting back on a few meals did the trick. I realized I needed to make big changes. My relationship with food was an unhealthy one. I wasn’t consuming food just for nourishment, but rather to shove down feelings. Eating was something I did to relieve stress. How I Began: I decided that I needed a strict approach because the concept of “having a little of something” was a slippery slope for me. It always got me off track, back to eating what I shouldn’t. So I committed myself to only eating food that was low in fat, mostly vegetables, fruit and lean protein. Initially, I looked up the calories of everything I was eating to get an better understanding of what I was eating. It was eye opening. 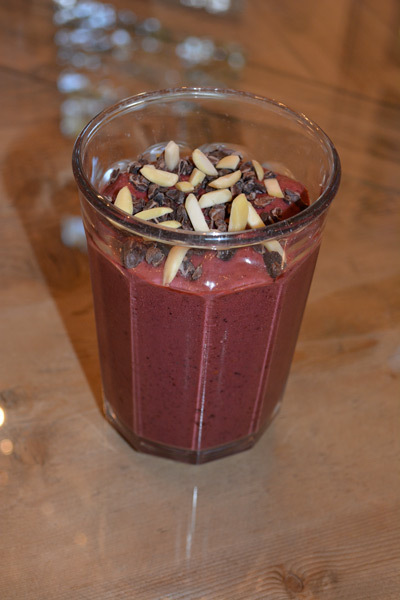 I started each day with a smoothie, full of protein, vitamins and fiber. I actually looked forward to having it each morning, made extra thick so it really felt like a meal. I experimented with all kinds of combinations to keep it interesting. I also tried not to go more than 3 hours without eating, just something small between meals like a dozen almonds or an apple. That really helped because I never felt starved and I was able to stay on track. I also decided there would be no desserts, for now ( besides fruit) until I reached my goal. I was a person on a mission, you could not have tempted me to cheat. Exercise also became part of my new way of life which I’ll tell you about in a separate post. The Result: Well 5 months later after a lot of discipline and hard work, I reached my goal! I felt like I was in the best shape of my life. I needed a new strategy that wasn’t as restrictive, a balanced approach that allowed for occasional indulgences. I decided that being disciplined during the week made it possible to enjoy a special night out on the weekend. Cocktails and a nice dinner in a restaurant or popcorn and some candy at the movies, became my reward of sorts for staying on track all week. This was something I could maintain for the long term. Back in February a friend of mine told me about a book she read regarding diet and health and she encouraged me to read it. I did and next time I’ll tell you about profoundly life changing it was.